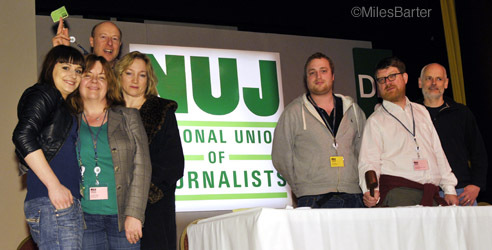 SEVEN members of Bristol NUJ have returned from the union’s Delegate Meeting, 8 to 10 April 2011 in Southport, having played their part in shaping the future of the organisation for the next 18 months. Bristol is one of the NUJ’s most active branches and our members have been instrumental in many of the important actions that DM brought to fruit. • Spoke up for a campaign against Northcliffe’s regional cutbacks, “which put profits before its local papers and staff”. The conference backed our plan to consider how the union can harness the enthusiasm of the blogging community and drive up quality among those bloggers who aspire to journalistic standards. Though there was some opposition from those who see a big divide between journalism and blogging, the conference decided that the union’s NEC should consider how the Code of Conduct could be used to encourage more interest in the union from parts of the new media community with whom until now there has been too little contact. Conference passed Motion 20 from the Equality Council, which reminded NUJ members that the union has a zero-tolerance policy toward sexual harassment at work and in the union’s structures, and asked the NEC to campaign to remind members to respect this policy at all times. A call for respect between all members, and for the union to be a safe space for all members, women and men, was applauded by conference. Bristol spoke up in favour of a national NUJ campaign against Northcliffe cutbacks, which have halved the number of newspaper journalists in Bristol in five years and have slashed staff even more drastically at other centres such as Nottingham. The cuts put unacceptable pressure on staff, DM heard from Nottingham members. We reminded the conference that Northcliffe is also infamous because of its hostility to trade unions which makes many staff unwilling to be identified as an NUJ member. Bristol members took a lone stand against other branches who wanted the union to declare opposition to the NATO military intervention in Libya as a last-minute addition to a motion setting out support for trade unions and the revolution in Egypt. Conference agreed not to declare opposition to the military intervention at this time and without a proper debate. Sadly the Libyan blogger stopped posting on March 3rd and his fate is not known. There was a big and at times heated debate about the NUJ’s Journalist magazine. One motion proposed that the editor should in future be appointed by the General Secretary rather than elected, as now, by the whole union’s membership. The other called for a review of the function of the Journalist Editorial Advisory Board. Questions were raised as to what the Journalist is for. Is it a propaganda tool of the union, or an independent voice on the union and journalism? The editorial independence of the editor and the magazine were said by some to be at risk from both these motions, but that was disputed by the motion’s proposers. Both motions were defeated. A new Board had already been elected at DM to serve for the next 18 months. In a new development, the Journalist has a section on the main NUJ website, called the ‘Platform’, and this too was guaranteed editorial independence in a motion passed by delegates. A Bristol motion condemned the ongoing scandal around phone hacking at the News of the World. Though there was no doubt about the Union’s support, our move received an unexpected boost just before one of our delegates spoke up. Breaking news revealed to the conference hall indicated that News International had admitted liability in a number of phone hacking cases and had offered to pay out compensation, believed to be up to £20million. Delegates from all over UK congratulated Guardian journalist Nick Davies and his incredible effort in exposing the News of the World over several years in which much of the rest of the media tried to ignore the story. The union noted that phone hacking is illegal, condemned the practice and committed itself to campaigning against it. The NUJ has become the first union to be mandated to call on the TUC to organise a one-day General Strike. This was part of a much wider motion condemning Government cuts, a motion which Bristol supported, but we thought it was right that one of our delegates should oppose part of the motion calling for a General Strike as we felt this would reflect the views of many members. We argued that General Strike would not gain the critical mass of support it would need to be a success, but no other delegates spoke in support and the motion was passed in its entirety. However, it is clear that the TUC is not currently supporting a General Strike, and other unions are far from unanimous in their backing, so the outcome of this plan is uncertain. In a step forward for photographers, the conference passed a motion to elect a photographers’ representative to the union’s National Executive Council. Bristol Branch backed this motion which also included a proposal to set up an elected photographers’ council, but this part was narrowly defeated, largely due to a previous motion that was passed to set up a review of the NUJ’s industrial sector councils. A motion was also passed on surveying photographers’ health and safety, including back problems. Members of Bristol Branch discussed exciting possibilities for extending the union’s professional leadership and expertise in the whole area of data privacy, data security and the interface between print and online journalism. We discussed what this might mean for standards and how, in the information age, the union could lead the way in professional practice, and be an industry-leading source of expertise and advice not only in working online, but also in creating new business and employment models while doing so. We also talked about creating a basic training course and tools for members in how to keep their data and online identity secure – increasingly vital for every journalist. Women from the Bristol delegation took part in the first-ever NUJ Women’s Rally at a Delegates’ Meeting, where guest speakers from PCS and Unite applauded the union and long-standing women activists, including the newly elected General Secretary Michelle Stanistreet, gave speeches, told their histories, and resolved to work towards full representation in the union’s organising structures. This was reflected by Conference passing a motion calling for gender-balanced nominations wherever possible, supporting a call for ensuring zero-tolerance sexual harassment, and agreeing the establishment of a dedicated web-based LGBT forum which, together with a newly agreed diversity audit, should encourage the equality agenda throughout the union. Bristol Branch members proposed and seconded Motion 112, passed by Conference, which instructed the NEC to set out guidelines for the use of whistleblowing sites such as Wikileaks. Given the sensitive, often explosive nature of this information, it would seem prudent to ensure that journalists continue to exercise the same level of caution as that used by the Guardian during the recent diplomatic cable exposé. The editors of these sites have their own agenda, which may be reflected in the selection of information. Whistleblowing sites state that they use a high level of scrutiny when editing information, to ensure that lives are not placed at risk. This is commendable, but the credibility of journalists and indeed journalism should not rest in the hands of often anonymous third parties. Bristol proposed a motion to consider changing the union’s structure, which currently requires members to belong to only one industrial sector – Broadcast or Freelance, for example. We argued that this doesn’t take account of the fragmented nature of employment nowadays – many members work in more than one sector. As it happened, DM passed another more wide-ranging motion calling for a big review of NUJ structures, and we are hopeful this will consider the changes we seek. Delegates from Nottingham and Bristol Branches supported a motion that there should be inalienable moral rights before the introduction of any legislation to allow the use of orphan works. The motion was defeated by arguments hinging on technical points, and that the motion as drafted was actually more limiting than the NUJ’s current position on OW which calls for comprehensive improvements, including the right to always be credited for one’s work wherever it is published. But it was good to hear NEC backing for the strengthening of moral rights as a pre-requisite for any orphan works legislation. Bristol backed a motion where it was agreed to improve verification that all those applying for or renewing their press cards are eligible and would need the card while carrying out their job. It was also agreed that a new photograph must be supplied when renewing your press card.